The first research-based monographs analyzing the genocide against European Jews were published in the immediate aftermath of the Second World War. Next to their counterparts in countries such as Poland and France, Hungarian Jewish authors – including Ernő Munkácsi, Jenő Lévai or Endre Sós – made some of the major contributions to this early wave of Holocaust historiography (avant la lettre), which have subsequently been largely forgotten and remain to be properly rediscovered and reassessed to this day. 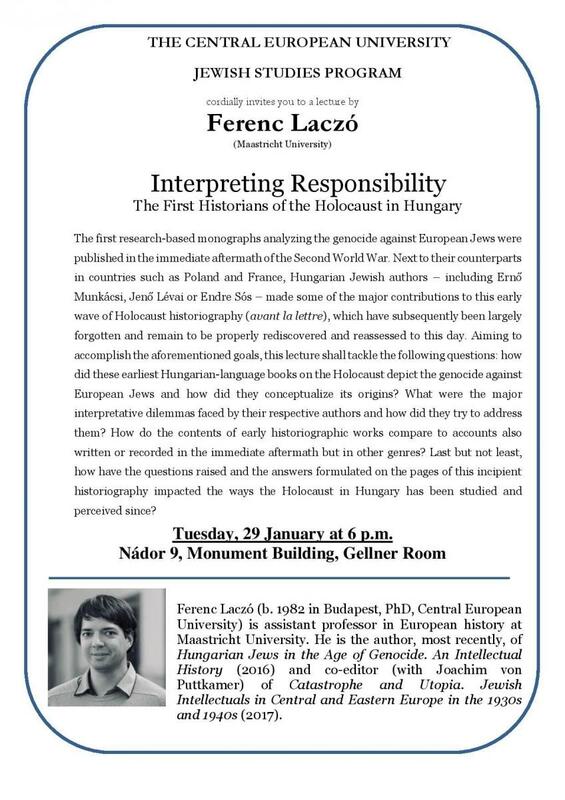 Aiming to accomplish the aforementioned goals, this lecture shall tackle the following questions: how did these earliest Hungarian-language books on the Holocaust depict the genocide against European Jews and how did they conceptualize its origins? What were the major interpretative dilemmas faced by their respective authors and how did they try to address them? How do the contents of early historiographic works compare to accounts also written or recorded in the immediate aftermath but in other genres? Last but not least, how have the questions raised and the answers formulated on the pages of this incipient historiography impacted the ways the Holocaust in Hungary has been studied and perceived since?